The Troubled Families Programme as enabled us to deliver more effectively on our ambitions to develop more sustainable approaches to support families and individuals with complex issues. It has also been the catalyst for wider service transformation across a range of public services. 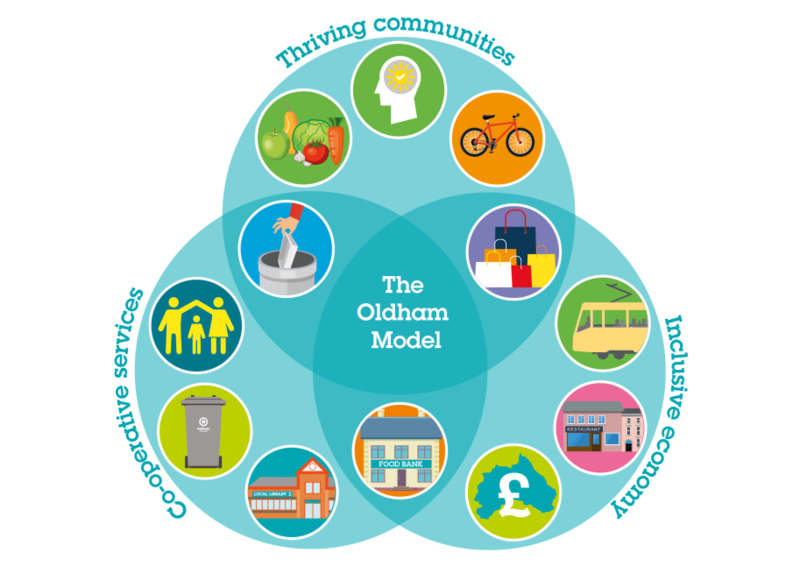 This fundamental shift in the way that we as a council work with partners and more importantly with communities will build resilience, capacity and improve outcomes for the people of Oldham. Started the process of mapping the community assets. Identifying Voluntary, Community, Faith and Social Enterprise Sector (VCFSE) organisations that want to participate and support residents – for example walking clubs or support groups for loneliness. This will help us to populate a database that can be accessed by professionals and communities and used as means to connect residents to ‘more than medical’ support. This includes community groups, activities and events which helps people access the right support before more serious health and wellbeing issues can develop. Developed a Thriving Communities Index. This divides the borough into 115 neighbourhoods and maps how well each of these areas are doing assessed against a range of factors based on place, resident and service demand. Examples of these wide-ranging factors include: green space, voter turnout, levels of crime, A&E admissions, percentage of pupils achieving a good level of development and smoking during pregnancy. The purpose of this index is to improve our awareness to help us prioritise investment and resources efficiently. Placed members of the community and the VCFSE at the centre of service delivery. This will ensure our staff have a better understanding to be able to respond and shape services to best meet the needs of the community. Statutory services work hand in glove with community and voluntary agencies, sharing understanding and expertise. We have conducted engagement events, street conversations, participatory budgeting and attracted additional funding from a range of sources. We have deployed Fast Grants to action some great small scale community ideas without any red-tape and we will be driving larger initiatives later this year though the Social Action Fund. By way of example, one of our priorities is tackling hunger and we have several projects addressing this. We have established a community café, developed growing hubs and improved cookery skills. Additionally, we have supported sporting activities run by local people in areas of deprivation and enabled parents to provide activities for children during school holidays. As a borough and as a partnership we are also investing heavily in tackling social isolation and loneliness across all age groups. We are working across a wide range of agencies and drawing on the existing expertise within communities through the VCFSE and grassroots community groups. The aim is to better connect people to the support they need sooner to build friendship and support networks which help our residents make better life choices. This difference in the Oldham approach can also be evidenced through our Place Based Integration sites. We have multi-agency integrated teams who are engaging the community daily on deep rooted system wide issues like antisocial behaviour, trafficking and community cohesion. Agencies including social care, health, housing, police, MASH/early help, benefits and again crucially the VCFSE work together though co-location and integration. They are drawing in multi-agency information on the locality from across the partners then making agile decisions which tackle the root of place-based issues. There are 4 focused sites currently live, with work being done to create a scaled and universal model. This is part of a wider set of ambitions to transform public services in Greater Manchester and Oldham is informing that approach. To convince commissioners about the value of early intervention, prevention and investment in community capacity we are building a robust assessment, evaluation and outcomes framework which is understood and recognised by partners. It is early days, but we have already made great strides with this. We already have some very positive case studies as a result of connecting local people to community assets, for example…. N is in her 30’s and has young children, she moved to Oldham from overseas when she got married. She has recently suffered bereavement following the death of a close family member. She has been to the GP about low mood and physical aches and pains – GP referred via postcard to Social Prescriber. Through introductions and activations – N is now accessing mental health / bereavement support, knitting and sewing groups, reducing her social isolation and is accessing parent and toddler activities. N’s next steps are enrolling on a lifelong learning course, physical activity and exploring employment opportunities. Are you making similar steps within your communities? I would love to hear your experiences.